Thunderous cloud bursts in the Pacific Northwest and scorching heat in the Pacific Southwest are dramatic examples of Nature's wonders, certainly different than "balance" as we generally think of the term in our lives. Entrepreneurs (and developing law firms) face the same dilemma of balance. We need skills, clients and capital. These three elements seldom come to the entrepreneur at the same time and in the same proportion as needed. 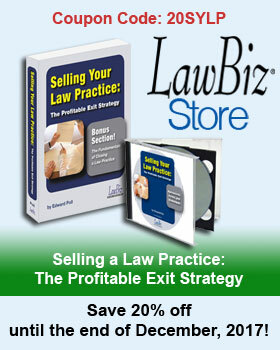 The fortunate and successful lawyers/entrepreneurs do what they need as they grow their business, The Business of Law®. On a state level, both Westlaw and Lexis have pending state legislation, committee hearings, budget information, oversight, and review on a third-party license database called "State Net". You can find the same information by visiting your state's website. At your fingertips is an information world that can help you expand your market reach, develop new business, and increase profits for the long term. You now have the data to help you drive clients by industry, occupation, age, and personal interests tied to the specific services you have to offer in today's world of legal complexity. Use the information to your advantage—and, remember, it's what you don't know that can hurt you, especially when it comes to staying competitive in a tough environment. "In the short time at Ed has been coaching me, his comments and guidance have been invaluable. Within weeks, he has improved my self-confidence immeasurably, guided me to run my law practice more like a business and most importantly, helped me obtain my goal of increasing my income while decreasing the time I spend working. It is a joy and pleasure working with Ed and I look forward to each coaching session. My only regret is that I did not start with you sooner."